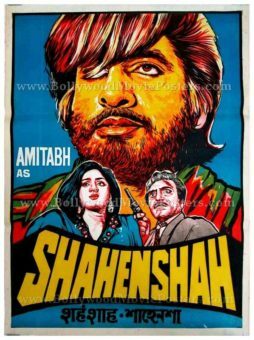 Beautiful hand drawn old movie poster of the super hit Hindi film Shahenshah (1988) for sale. 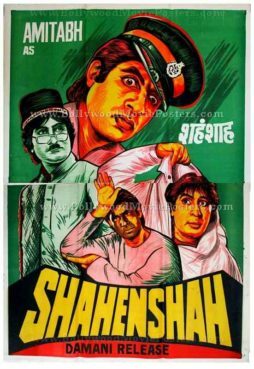 This is an actual surviving poster of the super hit classic Shahenshah that featured the angry young man of Indian cinema, Amitabh Bachchan in a superhero avatar. Printed and circulated somewhere during the release of the film, this quirky, hand drawn old Bollywood movie poster was originally designed for publicity of the film but never ended up being used. This quirky, hand drawn old Indian cinema poster is in absolutely top notch condition, with the exception of slight discoloration of the paper.